Latest post Wed, Feb 14 2018 10:28 AM by stefanocps. 15 replies. i have a project which i want to archieve. Don't know how to proceed, tried to transcode or consolidate..but then how to relink the new sequence to the new created files? I can tell you the way I do it and it may not be the right way. I have an internal raid 5 drive I use for current projects and backup that drive nightly. When the project is finished I use MDV media database viewer to collect all of the files used for the project and store them in an AvidMediaFiles folder on an external drive. I also store the project files on that same drive. you do all manually then? also if you move the position of the media, how do you reconnect the media to the new position when you reopen the project? Yes I do, there may be other ways to do it but I'm fairly sure manually is the only way. There isn't a collect files function like the one I use in After Effects if that is what your looking for. 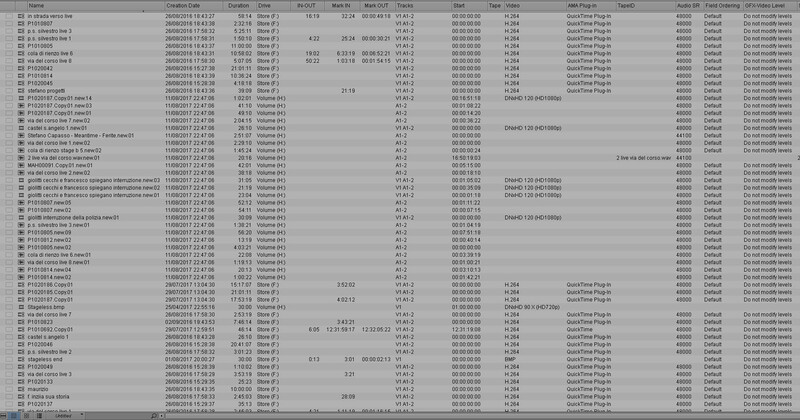 Using MDV is much easier IMHO to use than using the media tool in Avid. When I'm finished moving the media to an external drive I let Avid database the files on that drive, after Avid is done I open the project using the newely copied project files on the external drive and make sure all the files are there, basically just check the sequence. If you want you can also clean up the project before moving it using the Media Relatives and Reverse functions for the final sequence. The biggest problem you'll face is if material was brought into your project from another project. It will be harder to track some of the media files. What you can do is open the Console, and type RenameMediaFiles. It will give all the media files on the drives a "human readable" name, and each one will start with the first 5 letters (or 3, I'm having doubts) of the project. It will make it way easier to regroup stuff at the hard drive level. It won't help with AMA files though, only transcoded/imported/captured/rendered files. anyway should be something that i do manually, right? hod do i tell the project to point to those clip, that are moved in a different folder from the original stored iwth the project/sequence? First transcode all linked media (you can select that in the transcode settings tab) and then consolidate all to the drive you want to store the project. When transcoding be aware of the framerate and the rastersize of your source footage. I would suggest you select source raster dimension and keep source's framerate. If your linked clips are already in a format that is supported by mc natively then you can skip the transcode step. will i have to put the avid media folder in a disk called D ? may i safely go on like this? Did you consolidate your sequence or the source clips? You can check if you got all stuff together by temporarily renaming your Avid MediaFiles folders on your orginal HDDs. If they are renamed Avid MC won't see them and so you can check if you have all your media is still online and on the new drive.